Prince Hamlet of Denmark is not a happy camper. He has just been hurried back home from University to learn that his father the King (Hamlet Sr.) is dead, and that his mother has already jumped into “incestuous sheets” (I.i) by marrying his father’s brother, Claudius, thus making him the new King of Denmark. In short order, the ghost of Hamlet’s father appears to tell him that Claudius is responsible for his death and to urge him to take revenge. 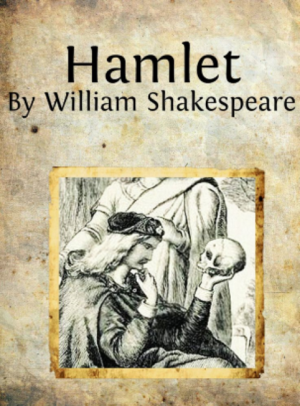 Hamlet is plunged into philosophical paralysis, at first utterly resolved to carry out his dead father’s wishes, and then vacillating continuously between action and inaction. Finally, he has the idea to have a group of traveling players play the scene of his father’s murder before his uncle in theatrical form, thus forcing him to admit his guilt. He does so, and once it becomes certain that Claudius committed the atrocity, Hamlet angrily confronts his mother for mindlessly shacking up with his father’s murderer. In a rage, he accidentally murders Polonius, his girlfriend Ophelia’s father, causing her to go mad and drown herself. The bloodbath continues: Laertes, Ophelia’s brother, comes to take revenge on Hamlet, and both of them are fatally injured in a duel, Hamlet’s mother, Gertrude, drinks poison that Claudius intended for Hamlet, and Hamlet manages to get one last (fatal) shot in at Claudius shortly before his own death. In the play’s final moments, Hamlet begs his friend Horatio to “draw thy breath in pain / To tell my story” (V.ii). Shakespeare’s longest and most frequently performed play, Hamlet is one of the most influential works in the English literary canon.